At the end of 2013 I blogged that I had finished 3 projects. The first of the three, the Advent Calendar scarf is here. Back on December 7th I finished a varsity style sweater for my granddaughter Makayla. 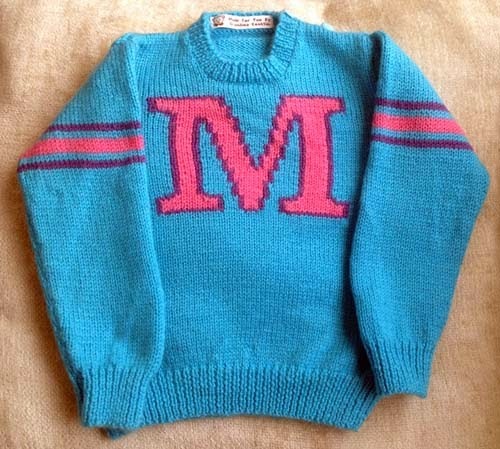 The "M" was done in intarsia. Size: 2 years - Makayla is 14 months old so it should fit her for a while. The sweater has been washed and dried in the dryer - no shrinkage. I crocheted a small closing with loops on the shoulder to make the sweater easier to put on. Note: It used to be, when I knit for little ones, I'd make a sweater with their name across the front. Then, I realized that this could be dangerous. How is a child supposed to know that someone might do them harm when they are being called by name? Now, I'd rather make a sweater with just the letter - safer, and it's more sporty in appearance. Kids, and parents, seem to like this style.